A centralized, secure data vault that protects your family’s most sensitive documents. Every wealthy family needs an encrypted system through which they may carefully provide their advisors with the right level of access to data such as bank statements, NDAs, due diligence reports, and contracts. The Family Office Vault allows families to control who can view, print, and download different files and groups of data files with their extended family members, attorneys, CPA, insurance agent, investment consultant, and other advisors or virtual family office team members. The Family Office Vault is a centralized, secure document repository that provides granular access only to those approved parties inside and outside the family. Proprietary document repositories often feature all-or-nothing security – that is, a user either has permission to access the entire document vault and all of its contents, or none of it. At best, a user may be granted access permissions on the directory level. The Family Office Vault solves this problem by providing multi-tier file access permission levels. This feature enables administrators to control access at the individual file level, if desired. In addition, secure document sharing permission can be granted with different levels of access so users can be permitted to view, but not print files, or to upload files, but not delete them. Another important security-related feature of the Family Office Vault is the ability to enable access by outside parties. Document repositories are collaborative by definition; so, it is not uncommon for external stakeholders to require access to a company’s internal knowledge base. Understandably, IT staffs are generally reluctant to allow non-employees to access their servers, and as a result, document repositories are sometimes stored outside a company’s firewall. Virtual data rooms provide high levels of security while enabling easy access by any authorized party, which facilitates easy collaboration on projects, communication between multiple stakeholders, and a better user experience. 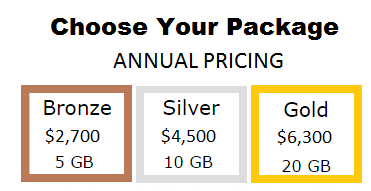 Bronze Package – 5 gigabytes of shared data. Ideal for small single family offices as a central repository to securely store many documents. Silver Package – 10 gigabytes of shared data. The silver package is well positioned for larger family offices. This package includes one data room and multiple folders and subfolders. This package includes DRM features to secure the most sensitive documents. Extra data rooms are available for just an additional $1,000 per year. Gold Package – 20 gigabytes of shared data. This package is ideal for large family offices or multi-family offices. This package includes 10 data rooms that allows for many moving documents and involved parties. If more data rooms are needed we also offer a Platinum package with up to 50 data rooms for just $9,500 per year. If you have any questions about The Family Office Vault, please feel free to reach out at 212-729-5067. The modern virtual data room has found a place in a variety of industries. The ability to share large amounts of documents quickly and securely has found a place in a variety of projects and to help keep companies in compliance with various regulatory bodies. Get started with your data room today. The Family Office Vault allows families to control who can view, print, and download different files and groups of data files with their extended family members, attorneys, CPA, insurance agent, investment consultant, and other advisors or virtual family office team members. Learn more about the Family Office Vault. © Copyright 2014 by DataRoomZ. All Rights Reserved.